When you’ve had a lot of fun on your travels, it’s only natural to want to go back. You want to redo your favorite things and try some of the things you didn’t get to the first time. The problem is, the second trip doesn’t always live up to the first. By going back, you run the risk of not only having a bad time, but also sullying the memories of your first great trip. So it is with game expansions. 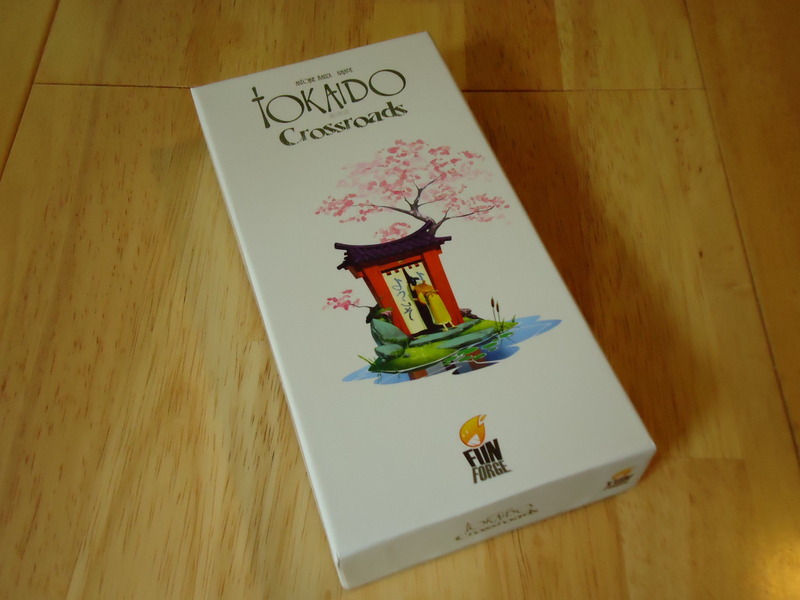 Does Tokaido: Crossroads, the first expansion for Tokaido, improve on the fun of the original journey, or does it ruin the fond memories of your first Tokaido trip? 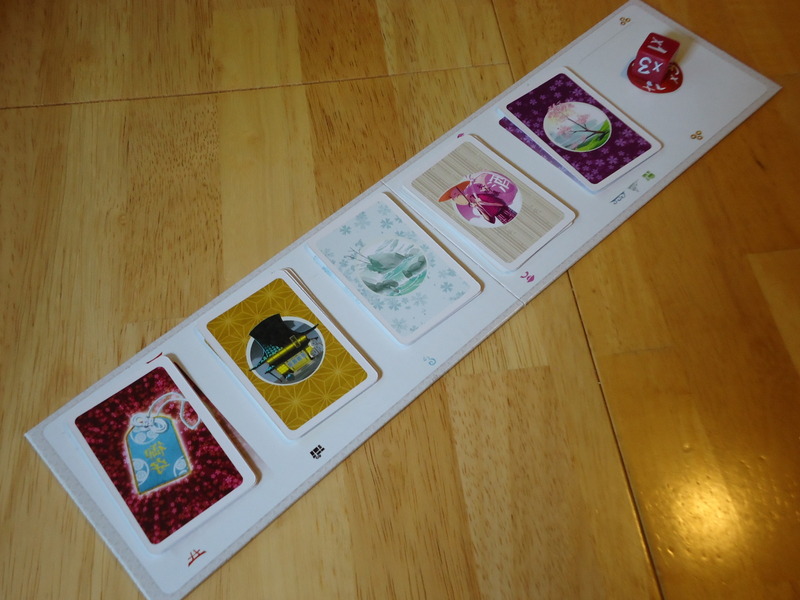 Tokaido: Crossroads consists primarily of five new decks of cards that add additional options to the spaces of the base game. You also get a Fortune die, a small board on which to place the cards and Fortune die, and some additional traveler character cards. The game is played according to the rules of the base game – which, if you haven’t played, you can hit that link to see our review – except now when you land on a space you can choose from two options instead of simply taking the one prescribed action. Here’s a summary of the new additions. Cherry Trees: When you land on a Panorama space, you can either take a Panorama card (base game rule), or take a Cherry Tree card. Cherry Trees give two points and one coin each. They are not collected in sets as the Panorama cards are. Bathhouses: When you land on a Hot Springs space, you can either draw a Hot Springs card (base game rule) or take a Bathhouse card. Bathhouses give four points. Farms: When you land on a Farm space, you can take three coins and add them to your supply (base game rule), or you can play in the Gaming Room. To play in the Gaming Room, you gamble two coins from your supply and roll the Fortune die. Depending on the number rolled, you’ll either lose money, earn money, or break even. Temples: A Temple space now permits you to either donate money to the Temple (base game rule) or pay a coin to take an available Amulet card. Amulet cards provide some benefit to the player, such as taking an additional turn, earning more coins, or taking free meals. Shop (formerly The Village): When you stop on a Shop space, you can either buy a souvenir (base game rule) or acquire a Legendary Object. Legendary Objects either add additional points to existing souvenirs, count as a new type of souvenir for the purpose of calculating set values, or are simply worth eight points apiece. Encounters: When you have an encounter, you can either take an Encounter card (base game rule), or pay one coin and acquire the Calligraphy card of your choice. Calligraphy cards add points for various accomplishments, collections, or results you might achieve during the game. Inns: There are no changes to the Inn spaces. The winner is still the player with the most points at the end of the game. A Worthy Destination or an Unnecessary Detour? When I first played this expansion, I thought it really was like traveling to a destination for the second time. You’ve already hit most of the highlights on your first trip and now you’re back to see more good stuff. At the same time, you’d also like to revisit some of your favorites from the first trip. Tokaido: Crossroads replicates this feeling. You can try all the new options for the spaces, you can stick to your old favorites, or you can do some combination of the two. Of course, just like when you go back to a destination and try to fit in more stuff, you’re going to have to make some hard choices about what to see and what to skip. You can’t do it all, so you have to choose wisely. More planning is required in order to do well and you need to be more observant so you catch all the action going on around you. Whether you enjoy this expansion or not will depend on two things: What you thought of the base game in the first place, and the groups of people you play Tokaido with. If you liked the simplicity of the base game, you might find that that Crossroads complicates that streamlined experience. The extra choices can be fun, but they do add some fiddliness to what was a very elegant and simple game. Scoring is now a bit more difficult and time consuming, and the game does take a bit longer to play. I wouldn’t quite call it AP prone, but it does take a bit longer to make a decision. 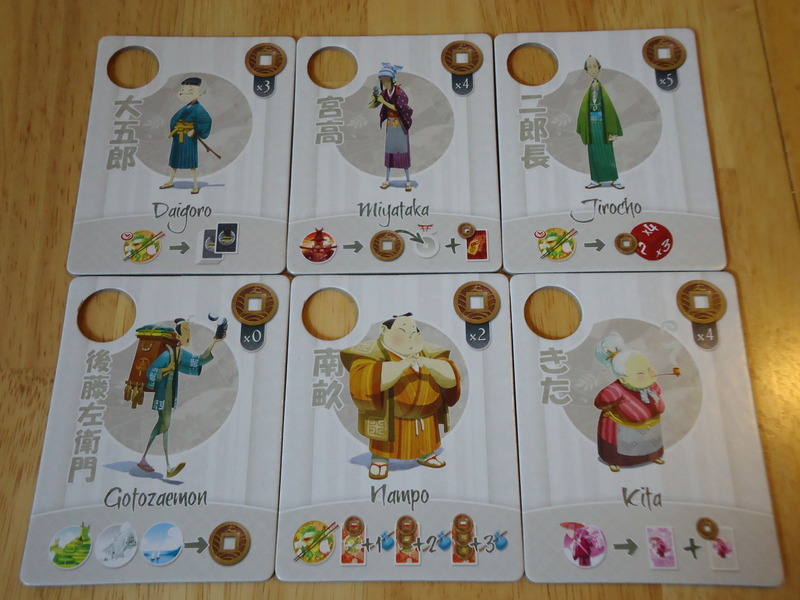 If you primarily play Tokaido with non-gamers, the expansion may not be welcome. The beauty of the base game was that it was incredibly easy for non-gamers to pick up and play. It was basically a “move forward, do this,” type of game. The expansion changes that. It’s still “move forward, do this,” but now you have to evaluate twice as many options. Which of your options will help you the most or possibly hurt your opponents? Some people just don’t want to make those kinds of decisions. They’d rather stick with the elegance of the base game. It also feels more competitive. 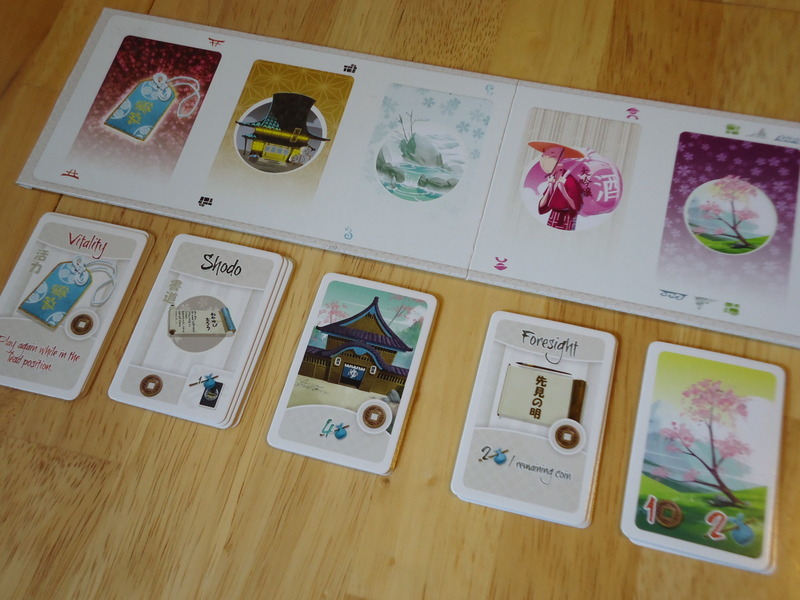 Tokaido was never a co-op, but the base game often felt like winning was secondary. As with travel, enjoying the journey was the primary objective. Sure, it was a game and there were winning conditions, but it never felt like it was competitive. “Oh, hey, you won, but look, I got this cool Panorama!” Crossroads takes a little of that away. It’s still a nice journey, but having to evaluate all of your options and make more decisions keeps the competitive aspect front and center. After all, why are you evaluating these decisions if not to win? Some people will like that, others will not. Additionally, the expansion can create some confusion. The rules are not particularly well integrated with the base game, leading to a lot of flipping between rule books to sort things out. Crossroads also adds some extra iconography to the game which can be confusing until you’ve internalized it. And, again, the rules aren’t always helpful with this. I’ve found that my non-gamer parents and friends enjoy the base game, but the additions of the expansion leave them frustrated. On the other hand, having more action choices gives you more options when it comes to crafting a strategy and overcoming your opponents’ strategies. The Calligraphy cards are particularly useful for shoring up strategies or making the most of events that befall you. For example, if you find yourself with a lot of coins, you can convert those to points at the end of the game if you also get the Foresight card. The Fasting card gives you three points for each uneaten meal, which can help you if you can’t/don’t want to pay for meals at the inns. If you realize that you are out of the running for some of the achievement cards, you can shift your focus to the other options and try to make the most of those, or at least stop your opponents from grabbing them. If you play with gamers, the expansion will probably get a warmer welcome. The extra decisions and potential strategies are the sorts of things that gamers feast on. While it’s still not a deep, brain burning game, it does turn a simple game into something meatier. Gamers also tend to have a higher tolerance for rule ambiguity and a better ability to quickly understand the new icons which may result in less frustration than non-gamers experience. One complaint about the base game was that it often felt scripted or as though players were on rails. With so few choices, there weren’t many strategies. Players often felt like there was only one path through the game and it felt samey after a while. Crossroads alleviates that feeling a bit. Now that you have two choices per space, it feels as though you have a bit more freedom to try different things. The one thing that gamers will lament is the fact that the expansion doesn’t really change the randomness of the game. Sure, you can now control a bit more of your fate by choosing between two actions per space, but those actions are still largely resolved by card draws and (now) die rolls. This is somewhat improved upon in the expansion because several of the expansion actions allow you to choose from any of the available cards rather than accepting a blind draw, as in the base game. But, still, you are not 100% in control of every decision you make. Is this expansion necessary to the game? No. The original Tokaido was not broken or lacking in any way. It was a good game if played for what it was: A simple, peaceful journey through the Japanese countryside. The expansion changes that, but it doesn’t break the game in any way and it does bring some interesting additions to the game. Whether it’s for better or worse is going to depend on your group and personal preferences. Get it if you want more decisions, don’t mind extra fiddliness or play time, or if you’ve played Tokaido a lot and think it’s getting stale. Skip it if you absolutely hated Tokaido (it doesn’t change the game enough to rescue it in this case), or if you love Tokaido exactly as it is and want to preserve that peaceful, simple feeling. Adds additional choices, alleviating the scripted feeling of the base game. Allows for more decision making and strategizing when compared to the base game. Extra characters are nice if you've gotten tired of the old ones. If you've played Tokaido a lot and it's gotten stale, Crossroads is a refreshing change. Added complexity may be a turn off for those who liked the simplicity of the base game. Rulebook and new iconography aren't particularly well integrated with the base game. It doesn't appreciably change the random nature of the game. Next Article Dragon’s Peak #9 – Are You Excited For Spiel 2015 Yet?